Originally on this site, stood a one story frame building (1850), owned by Thomas Bell (1814-1907) and his wife, Esther (1832-1915). Thomas Bell was one of the first undertakers working in Marmora. Upon his death in 1907, his nephew, Baldwin Chester Hubbell (1864-1936), and his wife, Mary E. English (1868-1920) built the Hubble Block, which they operated as a general store and undertaking business. A review of the business interests of Marmora would not be complete without mention being made to the establishment of Mr. B.C. Hubbell,which has met with deserved success. 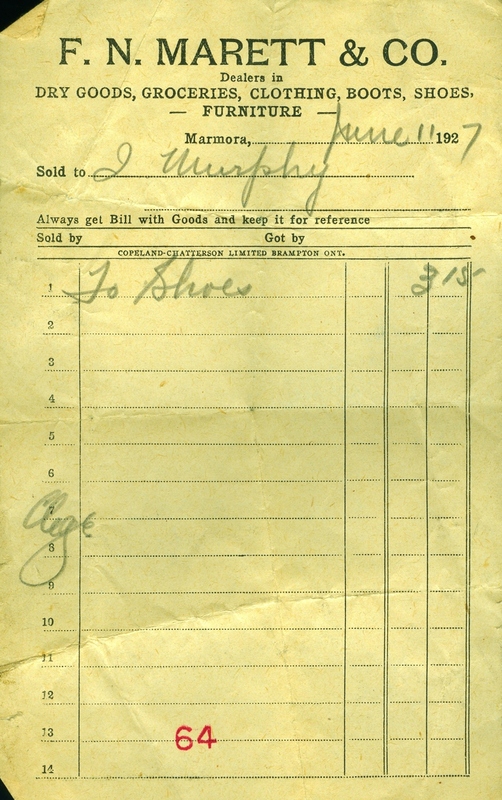 He is a dealer in dry goods, groceries, boots and shoes, furniture and undertaking. 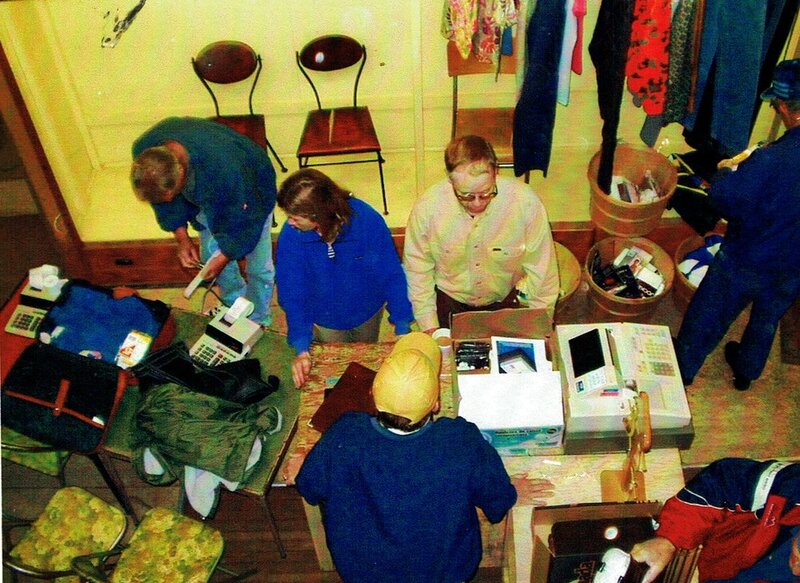 The Premises occupied in the Hubbell Block, Forsyth St embrace a store comprising 2 floors of large dimensions and is a most convenient place for the people of Marmora and surrounding countryfor family supplies of any kind and consequently it is a much frequented place. surrounding country, and is steadily increasing in patronage, All orders are promptly delivered, special attention is paid to undertaking. Calls are answered day or night. The business is under the supervision of Mr. B. C. Hubbell. He is an able and progressive businessman, thoroughly reliable and highly esteemed in business and social circles. It was 1911 when Hubble's business went into receivership and was sold to William Henry Litt (1867-1937) and his wife, Flora James of Teeswater. Fred Wells had an experience last Sunday which he would not care to repeat. He was out in his boat a short distance from shore and started to put his outboard motor in place when in some way he lost balance and fell overboard with the motor in his hands in about 14 feet of water. It happened so suddenly and with such a shock, it did not occur to him to let go of the motor until he swallowed considerable water. The first time he came up feet first and went down again, but the second time he came up and started to swim to shore. The motor was later recovered. Josiah William Pearce joined his brother T. P. Pearce in Marmora in 1871 to run the Pearce Company store. In 1902 he was elected Conservative member of the legislature and took F. N. Marett (who later became Reeve of the Village) into the business to look after the store for him. On March 1, 1907, the Marmora Herald announced that Frank N. Marett enlisted into partnership with Mr. Pearce. The business became known as Pearce and Marett and at that time was situated across the street at 13 Forsyth. F. N. Marett married Josiah Pearce's daughter, Jane, in 1908. That same year they expanded the store, at the back, by 30 feet. The Herald reported on March 9, 1916, "Frank Newton Marett & Co. have purchased the B.C. Hubbell Store (from Litt) and are making a number of alterations before moving their stock over to the new premises. The firm will also handle furniture in their new quarters. " In April of 1916, they further reported that the company was excavating for the erection of a building on the south side of their new store. (16 Forsyth St) The alley way was to be between the new addition and Dan Shannon's hardware store to the south at 18 Forsyth. Members of the firm were F. N. Marett, W. C. Inkster and F. R. Wells. A few years later Mr. Marett bought out Mr. Inkster, and Donald Marett joined the firm in the early 1930's. Donald Marett and Fred Wells carried on a partnership with Fred running the funeral part of the business until 1954 when he severed ties and started a funeral home where Garnet Howden and now McConnells are located. Embalming was done out back in a shed and the dearly departed, as was the custom in those days, was transported by horse and wagon to the family home for viewing. In July of 1928 F.N. Marett and Co. bought their first motor hearse. Donald Marett ran the business until January 1968 when he died and Bill, his son, continued from 1968 until June 2, 2003 when the store closed its doors. Over the years the store carried everything from wallpaper, paint and floor coverings to groceries, dry goods, clothing, shoes, lamps etc.Upstairs in the front room people picked out their coffins while deciding on the latest linoleum and paint. 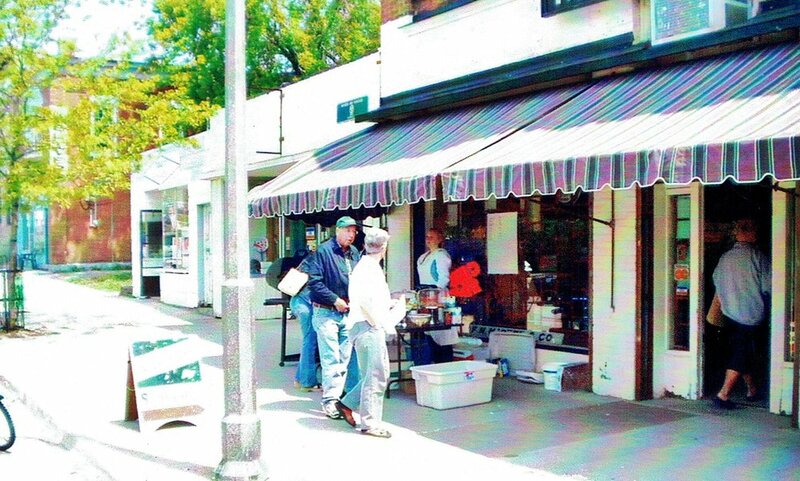 See Pat Marett's photo collection in "Your Photo Gallery"
On July 12, 2005, Julie Maynes opened her Boutique and Gift Store called "Twist". It closed in 2010. Thereafter, Sheila Cook and her daughter, Sheila, offered fresh baked goods in the "County Home Bakery", with baker, Morley Perrie. This was followed by "Sandra's Closet" , and then in 2017, "Possibilities", a furniture and gift store run by Wendi McCoy and Lisa Booth, who moved their business from 29 Forsyth St.